$5 drop-in, or purchase a punch card with 5 visits for $20. There's no Toddler Time on February 19, 20 and 21 due to February vacation break and April 16, 17 and 18 for April vacation break. Join us for toddler-friendly art projects and other activities in our newly-renovated adjacent music, movement, and visual art spaces. Leave the mess and cleanup to us and just enjoy your child and the company of other caregivers. 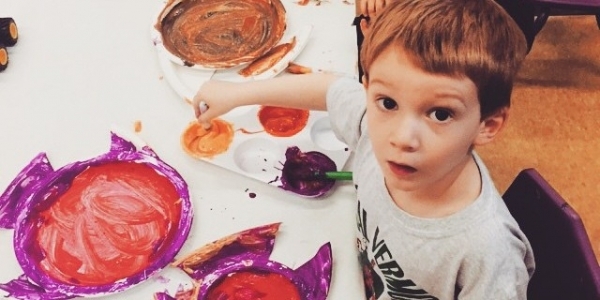 Each day we’ll explore a new art adventure to engage the senses and the imagination. We’ll also have rotating free play activities aimed at stimulating socialization and child motor, language, and cognitive development. When weather permits we’ll have outside playtime as well. Say goodbye to long, boring mornings and hello to creativity and social time with other families. Note: no Toddler Time February 19-21 and April 16-18. Candace Matheson holds an MA in Education. She is a former college English instructor and a current stay-at-home mom with two busy toddlers. Candace spends her time seeking out and developing fun and creative educational activities for young children.